The aim of this module is to raise awareness regarding the benefits of collaborative learning between learning and business field. It will show examples and methods of sharing knowledge and experience and give motives to learners to participate in the collaborative process. Collaborative learning is the situation when two or more persons learn together. The main concept is that persons involved interact, using the resources and skills of each other, asking one another for information, peer evaluating their ideas, exchanging feedback, etc. The process can be implemented face-to-face (e.g. discussions, group study), from distance (e.g. online forum, chat room, e-learning platform, wikis etc.) or both combined as a blended solution. Collaborative learning used to be more common among students who form a study group or it could be through a student-teacher relationship. Nowadays, collaborative learning involves companies as well, forming various types of collaborative groups: learning communities, communities of practice, project teams and other. From the link between the education and business worlds arise benefits both for innovation and learning. The schools and/or learning providers can exchange their research results and fresh minds of their students thinking out of the box, with real business world challenges for their students. 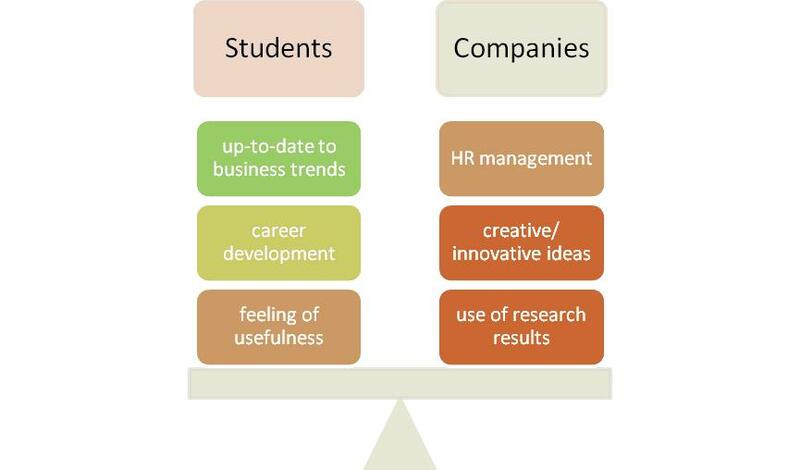 Education is the first step for the student but in order to help the student find the best career for him/her-self, the contact with the current business trends should take place in parallel. In that way, students are up-to-date to face business market opportunities, they can choose their career path and development more consciously and moreover they obtain the feeling of usefulness watching their research results turn into real development plans for businesses. On the other side, companies can use the research results from the students in their R&D processes and exploit the creativity of fresh young minds with the potential of thinking outside the box. In addition, the HR departments could use the interaction with students in order to find the best candidate for a job position. Testing the applicants in company’s real activities, employers can recognize the students’ skills to transfer their theoretical knowledge into practice, while the students can find out if this particular job suits best his/her potentials. Open innovation derives from the idea that an organization interacts with its environment and there is free flow of ideas inside and outside of it. “Free” does not mean without financial cost, as payments of intellectual rights and license fees could be involved. It means that there is sharing and accessing to information and technology in an open-ended way. Problem solving instead of relying exclusively on the internal skills and knowledge pool of the organization, it involves external players in the innovation process in order to acquire information on needs or solutions. These models could bring closer organizations such as universities, SMEs, start-up companies, suppliers and customers as well. 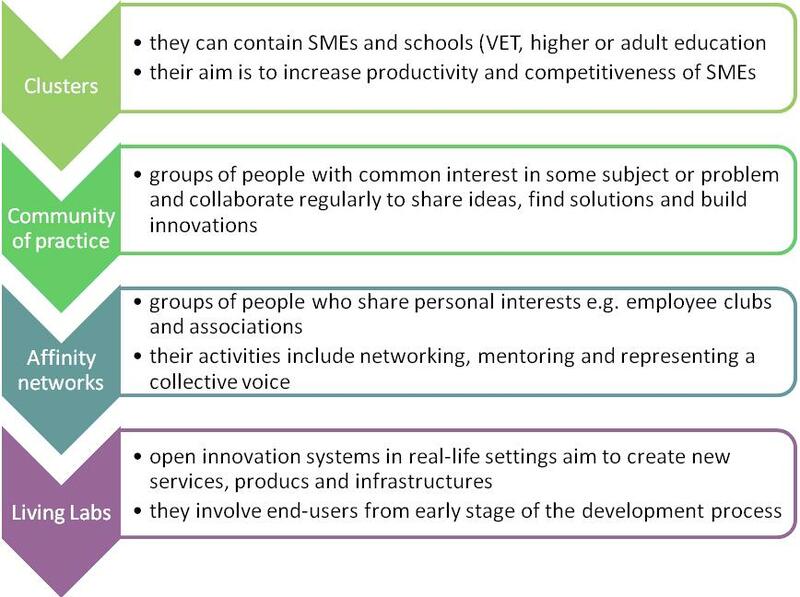 Some examples of open innovation tools are lead-user method, toolkits, innovation or idea competitions, broadcast search platforms and open innovation communities. 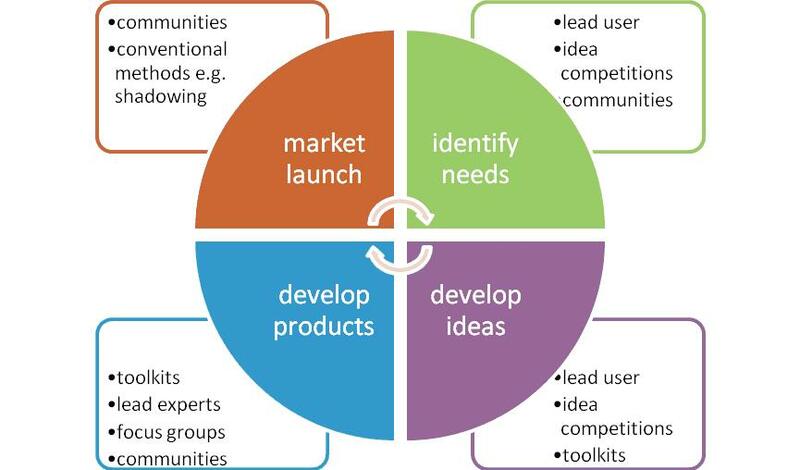 The tools can be integrated at different stages of the innovation process . Collaborative learning promises more effective and efficient generation of ideas and solutions and mutually benefits both learners and companies. Learners are motivated to get involved in real work based challenges, while companies get input for their innovation process. Learners can get in contact with real business opportunities before they choose their career development, while companies can achieve effective HR management, finding the most efficient candidate for a job position.